What Day Of The Week Is September 15? 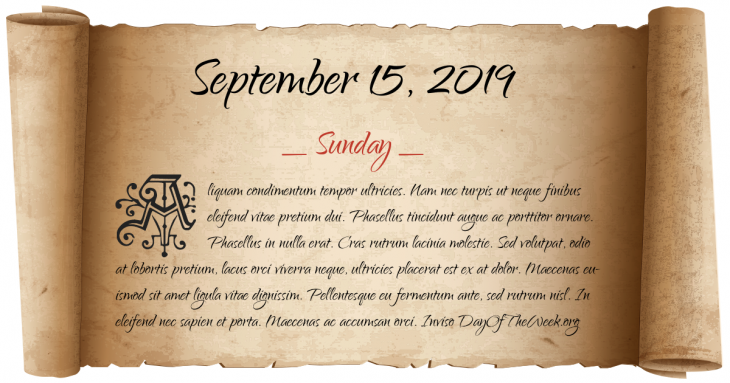 September 15, 2019 is the 258th day of the year 2019 in the Gregorian calendar. There are 107 days remaining until the end of the year. The day of the week is Sunday. At Tetin Saint Ludmila is murdered at the command of her daughter-in-law. Gilles de Rais, one of the earliest known serial killers, is taken into custody upon an accusation brought against him by the Bishop of Nantes. Seven Years War: Battle of Signal Hill. The United States Department of State is established (formerly known as the “Department of Foreign Affairs”). The locomotive John Bull operates for the first time in New Jersey on the Camden and Amboy Railroad. The French département of Corse (the entire island of Corsica) is divided into two: Haute-Corse and Corse-du-Sud. Who were born on September 15?